Before we start setting button links in Page Studio, there's a few formatting requirements to take note of. When setting links to other web pages, always include the https:// portion of the URL. When setting links to an email prompt, format the link by prefixing your email address with mailto:, as seen in the image below. Follow the steps to set links within Page Studio buttons. 1. Starting from the Page Studio editor, add a Button block to the page. 2. Hover over the button, then click on the Edit Link button. 3. Replace the Link field with your URL. You will only be able to adjust the links on Button content blocks. 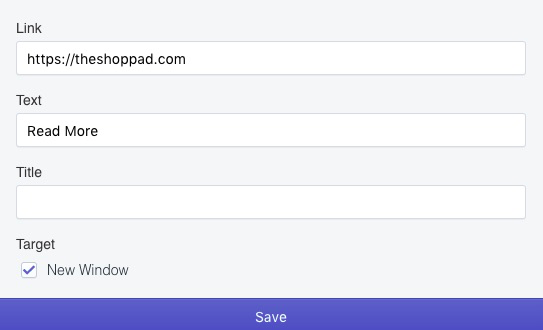 For the Form content block, messages will only be able to send to the email address you have set to your Shopify Customer Email. The Text field will control what text appears on your button. The Title field will be the text that appears if a visitor hovers over the button on your store. The Target field will control whether the visitor is taken to a brand new window in their browser when they click on the button.